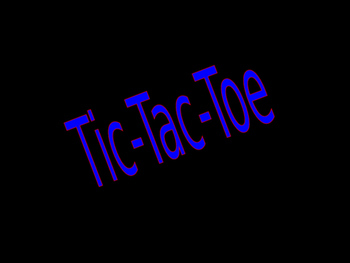 Powerpoint Game "Tic Tac Toe"
Tired of Jeopardy? This is a new take on an old game...tic tac toe. It can be used for any grade and any subject. 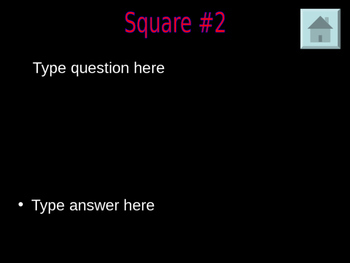 Add your 9 questions and answers into the slides and play the game. Divide the class into two teams. Have teams take turns picking a question. 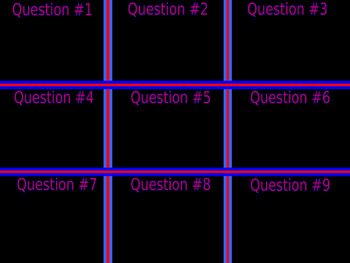 Click on "Square 1" or "Square 2" to go to the question. Click again to reveal the answer. Click on the button in the lower right to go back to the tic tac toe board. On the tic-tac-toe board, click in the middle of the square ONCE for an X to appear. Click THREE times for an O to appear. I usually let the class be X, and if they miss the question, I put in an O.